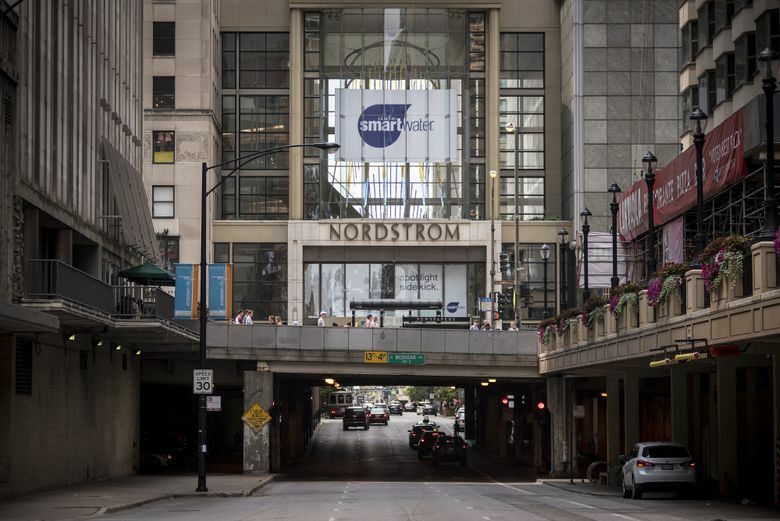 A Nordstrom store is seen in Chicago, Illinois, on Aug. 5, 2017. (Christopher Dilts/Bloomberg). Nordstrom shares sank on Wednesday, one day after the Seattle-based chain gave an update to its holiday sales that were seen as disappointing, prompting a number of analysts to lower their price targets. Goldman Sachs was particularly bearish on the news, downgrading the stock and sharply lowering its target price for the next 12 months. “In short, we got this call wrong,” it admitted to clients in a note. The stock closed down 4.8 percent at $45.01 Wednesday, after having dropped as much as 8.9 percent earlier in the day. The stock is down nearly 33 percent from a November peak of $66.98. Slashes price target to $50 from $73 “to reflect our lack of conviction on an upward inflection in full-price execution, incremental concern on the high income and tourist consumer, and recent financial market weakness.” Goldman’s previous target had been only slightly below the Street-high view of $75. Downgrades Nordstrom to neutral from buy and removes it from conviction list. Getting an update was unexpected, but the weakness of the numbers was not. Price target cut to $62 from $64. Lowers price target from $47 to a Street-low $43.